BEAVERTON, Ore. – Celebrating its fourth annual dance party, ADAPT 2018 is a dance event and competition that brings all dance styles to one dance circle. You can join the dance festivities on Saturday, Aug. 25 from 4 to 10 pm.at The Round located in downtown, just off the Beaverton Central MAX stop. 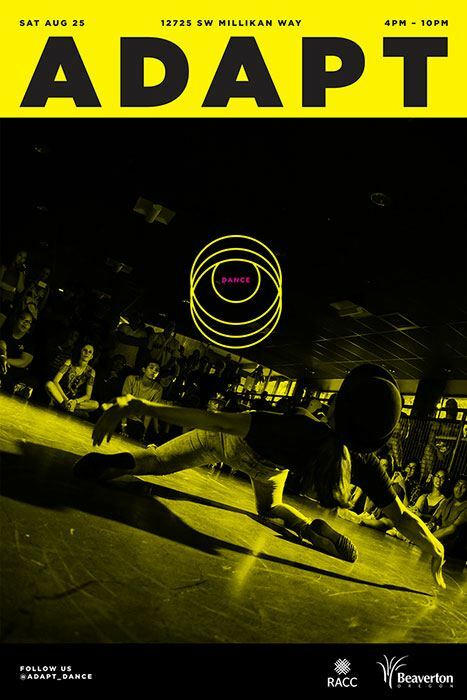 ADAPT will feature one-on-one dance battles and offer prizes for the competition. An invited guest judge panel will declare the best dancer of the day. Each competitor is judged on their creativity, musicality and foundations, as well as many other areas in 30-second rounds. In past years, the event has brought dancers from throughout the Pacific Northwest to compete. The event is free and open to spectators. All visitors are highly encouraged to participate in the dance party. For those looking to participate in the competition portion of the event, there is a $10 registration fee and a request to please arrive before 3 pm for preliminary rounds. For more event information, please contact ADAPT at 503-901-4557 or ADAPTdance@gmail.com. ADAPT is new this year to Beaverton and was one of four events that received a one-time placemaking matching grant from the City of Beaverton. The next event to receive this grant is the Beaverton Oktoberfest happening on Saturday, Sep. 29 from 3 to 8 p.m. at the LaScala Food Hall. The other two events will be occurring summer 2019.